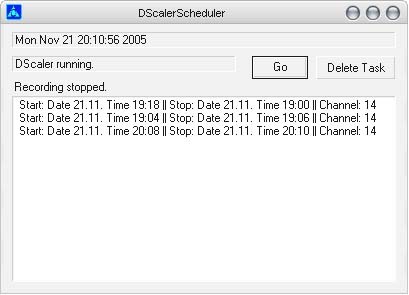 After researching in the web i noticed that quite a lot people would like to use DScaler for their scheduling applications So i decided to move a step forward and give my little tool some interface and make a few easy modules that can be used by others to interact with DScaler. This Version works with the TvBrowser Capture Plug-in and lets you simply add record tasks per double-click in TvBrowser. In the interface you can delete tasks. The check-interval is 60 seconds, so its related to the start– and stop-minute. If there is any feedback in near future i might write some documentation for it, but the code is very simple. My code is module based so you can easily use it for other applications. 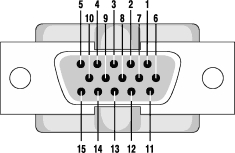 Some installation instruction with simple pictures can be found here . Please leave comments about compatibility. I’ve been searching for some program that is capable of real-time recording XVID videos from my Hauppauge WinTV PCI card. 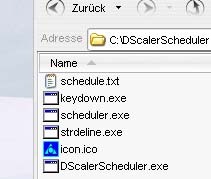 Dscaler needs a lot time for configuring all settings but in the end its a great tool. You can even “hide” the channel logos using some plug in called “Logo Killer”. Recording XVID on CBR(Constant Bit Rate) at like 900Kbps with some MPEG Layer-3 for Audio works really nice. The Problem is that there is no decent scheduler for recording coming TV shows. So i found this awesome Java based Open Source project TV-Browser , a free TV program magazine for your Windows, Linux and even Mac. How to combine these 2 Programs now ? TV-Browser has some Capture Plug-in. You can assign “External Channel Name Parameter” and use command line tools. Since DScaler has no command line control i tried to make my own. Using the window handle(FindWindow) and sendMessage (getting the wParam and lParam by Spy++). It works on my Win XP if DScaler is already running. Well, instead of using keystrokes to perform action i tried it this time with menu and window handles. It is working pretty good. 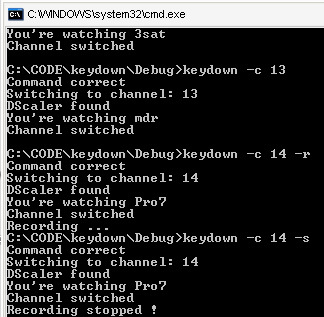 I’ve added the output of the tv channel name out of DScaler. Other suggestions are welcome. You can download the tool with source code here. Since the Online Documentation for Fox-Toolkit is not very fast i found the “FOX Documentation for Visual C++ version 7, HTML Help 2 format” FOX-docs-vc7-setup.msi . In order to install it you need to select in .NET Studio 2003’s options (Environment -&gt;Help) the “Internal help” called “Visual Studio .NET 2003 Combined Help Collection”. Than go to the help manager by using this link “ ms-help://MS.VSCC.2003/VSCCCommon/cm/CollectionManager.htm “ in your MSDN Library Help and set “ Fox Documentation “ for your VSCC. Refresh , restart the MSDN Help and your are done. I created some helper tool for the recent beta of the HTTP-Tunnel Client v3.4.2852 . It detects the running process of the HTTP-Tunnel and restarts the application when its process memory usage surpasses a certain amount. 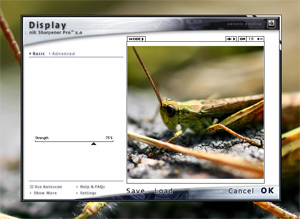 The application can be minimized to a tray icon by double click on the tray icon . You ever wanted to have the nice Wallpaper Changer from Mac OSX for your Windows XP ? Now you can have it with a few simple steps. 1. Download this file rotator.zip. Extract it to any location you want. You will find a file called rot.htm and a folder pics/ containing 4 sample images. 2. Add your images to the pics/ folder and rename the image files to a#.jpg for example your 5th pic would have the name a5.jpg If you have many pictures you can use some Batch File Renamer like this one FileRenamer . 3. Edit the rot.htm file in the upper part. Insert the number of your images. 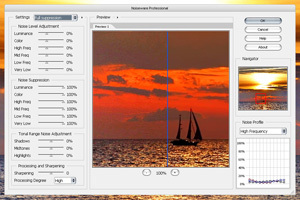 If you have like 7 images you simply modify it to images = 7; . Save the changes. 4. Got to the Windows Desktop Wallpaper selection screen and simply chose the rot.htm . Done. A demo (using IE) of this Application can be seen here(only IE, slow transition so have patience). Today I decided to tryout Blogger.com and search for some utilities that make it easy to blog such as windows applications. Found tools like BlogJet and blogbuddy , ecto and so on. I need some drag&drop picture add tool that creates thumbnails itself and uploads everything itself without questioning. Just found this site with lots of tools about blogging. After trying all of the tools BlogJet is my final decision for now. Hello has lots of login problems and the application bugs you with its problems all the time. So I got some webspace at funpic and decided to use BlogJet’s ftp upload feature.